Join in Antrim Live for The Jurassic Loc Down and Fossil Hunt and dive into the world of prehistoric beasts. Antrim Live returns to the heart of Antrim from Friday to Sunday, April 5-7. Antrim Town will be buzzing with activity during this weekend of cultural extravaganza. Mr Hullabaloo wil be among the performers at Antrim Live this weekend. Now in its third year, Antrim Live is a festival of fun with something for all ages to enjoy. Kicking off this year’s event on Friday 5 April, Nuala McKeever brings her new stand-up comedy show “Letting Go or Losing It” to The Old Courthouse, whilst the fun fair arrives in town at the Castle Mall car park. Take in the sights and smells and sample some of the culinary delights at the Artisan Market. Or join in The Jurassic Loc Down and Fossil Hunt and dive into the world of prehistoric beasts! Jay the T-rex and his little sister Roxie will be stomping their way into Antrim Castle Gardens in a fully interactive show. Be enchanted on a tantalising treasure trail where an array of quirky characters will guide you and surprise you as they take you through a wonderful, Wonderland Wood! The Bop Bop Baby, storytelling with Mr Hullabaloo, street performers and fun fair will provide the children with hours of endless fun. There will also be the chance to Take a Tour of Pogues Entry the home of Dr Alexander Irvine on Saturday, April 6. 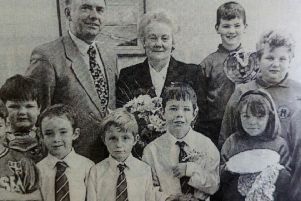 Meet the Lady of the Chimney Corner and some of the characters who shaped Irvine’s Life and work. Antrim Live has a great line-up for the whole family to enjoy and is open to all. For a full programme of events visit www.antrimandnewtownabbey.gov.uk/antrimlive.